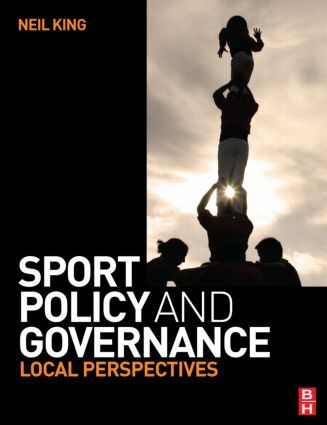 Sport Policy and Governance: Local Perspectives is the first detailed study of the politics of sport policy at the local authority level of governance. In focusing on the local level, the book recognises that the extent to which we benefit from public policy is a result of where we live. Taking the city of Liverpool as its core case study, the author investigates the changing contours of sport policy from the inception of the service area in the 1970s through the economic and political turbulence of the 1980s to the year of European Capital of Culture 2008. As the book gives centre stage to the period since 1997, the changing parameters of local sport policy are located within New Labour priorities around elite sport development and the instrumental uses of sport to deliver social policy goals. Traces the evolution of the relationship between central government policy priorities and local sport policy and practice. Provides a political analysis of sport policy that foregrounds competition between differing interests in a context of scarce resources. Explores relationships between local authority policy for sport and policy relating to education, health, land-use planning and community regeneration. Assesses the strategies utilised by sport policy actors in pursuing their interests. Theorises contemporary sport policy processes and establishes parameters for future research. Sport Policy and Governance: Local Perspectives is essential reading for anyone who is studying or teaching sport-related degree programmes, researching public policy, or who is a practitioner or policy-maker in the sport sector. Dr. Neil King is Senior Lecturer in Sport Development at Edge Hill University, UK. His research, teaching and curriculum development largely centres on public policy, governance and development for sport, recreation and physical activity. His other research interests include policy for education, health, land-use planning and the environment, youth justice, culture, and urban regeneration.